HALF MOON BAY, California (AP) — Several people standing on a seawall watching the Mavericks Surf Contest were struck by an unexpected big wave, hurting some of them seriously enough to require medical attention. It was unclear if anyone was missing or how many people were injured. Dozens of people were standing on the wall when the wave hit. Contest officials and San Mateo firefighters weren't immediately commenting early Saturday. Brandon Snider was one of those hurt. He said everyone's concentration was on the contest when a 5-foot to 6-foot (1.5-meter to 1.8-meter) wave "wiped out the entire seawall." He says it's unclear how many people were on the seawall, but he believes some were injured seriously. Snider was getting his knee taped up by a contest volunteer as he spoke to an Associated Press reporter. At least three others were getting medical attention. 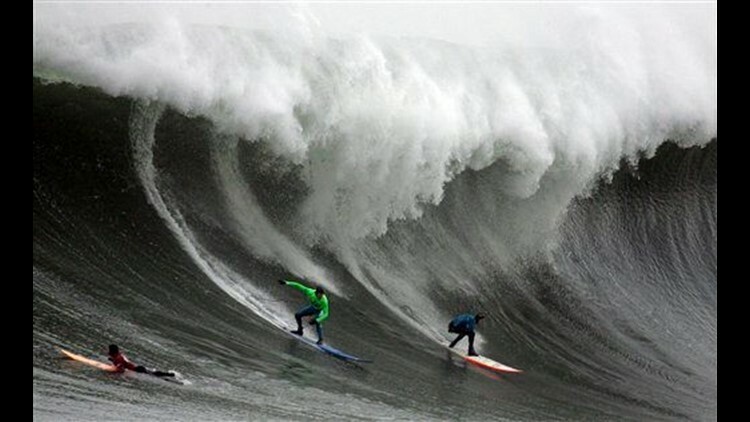 HALF MOON BAY, Calif. (AP/CBS 8) — With big wave surfing's biggest prize at stake, six of the 24 contestants paddled into position half a mile offshore and began careening down the face of 35-foot waves. The heavy fog present at dawn began to quickly burn off above the Northern California coast shortly before the 8 a.m. start time for the Mavericks Surf Contest Saturday. Ideal conditions were forecast for the rest of the day, which was expected to be mostly sunny. Surfers are judged on their best two waves, and the top three scorers in each heat advanced to the semifinals. Record-breaking tall waves were predicted as controversy looms over the event: Surf legend Jeff Clark, the founder of the celebrated event, is embroiled in a nasty legal dispute with the company that now runs it. Clark, who is credited with discovering this surfing zone — a rocky break one-half mile offshore — will not be a part of the contest for the first time in its 11-year-history. He accuses Mavericks Surf Ventures Inc. of selling out the contest for commercial gain. Mavericks chief executive Keir Beadling counters that the allegations in his lawsuit are "completely false." The event begins when the first six or 24 world-class surfers are ferried by jet ski to the surf spot. Each heat of six surfers competes for 45 minutes, with each competitor allowed to catch up to 10 waves. Surfers are judged on their best two waves, and the top three scorers in each heat advance to the semifinals. The contest is not held every year and is called only when conditions are prime. In the past, Clark made the decision when the event would he held and gave competitors 48 hours warning. This year the competitors voted. Now all eyes are on radar maps, the skies and the waves. The waves are expected to be huge and the sun to be out. But forecasters say there is a chance for south winds in the morning. Surfers say that could make for choppier waves than if the winds were out of the northwest, which is expected in later afternoon rounds. The dispute has fiercely divided loyalties in the insular world of surfing, with some defending Clark as the soul of the contest and others criticizing him for committing the original sin by publicizing a once-secret surf spot. "This is a dispute between Jeff Clark, a passionate and respected member of the international surfing community, and a series of corporations and persons with no interest in surfing other than as a source of corporate and personal profit," stated the lawsuit filed last month. Clark, who owns a surf shop in Half Moon Bay that sells his own line of Maverick's clothing and surf gear, declined to comment through his attorney. In 2003, Clark went into business with Beadling, a Bay Area sports entrepreneur, and launched the company now at the heart of his lawsuit. Clark's lawsuit complains that the company failed to pay promised salary and unfairly used his name and image in promotions after he was fired. Beadling declined to further comment on the suit, saying he wanted "to stay positive" and promote a contest that he predicts will attract 50,000 spectators to this tiny harbor town 25 miles south of San Francisco along Highway 1. Beadling said the Mavericks company is nearing profitability for the first time. It unveiled a clothing line several months ago that he said is environmentally sensitive. Meanwhile, the company has lined up Sony Ericsson, Barracuda Networks Inc. and several smaller companies such as the whiskey maker Jim Beam and the brewery Sierra Nevada and is offering $150,000 purse, twice the amount in 2008 when the last contest was held. It is the most lucrative big-wave contest in the world.